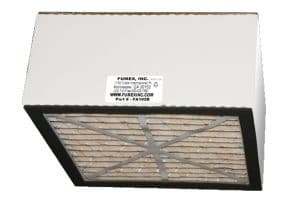 Choose the Replacement Air Filter that corresponds to the Fumex Industrial Air Cleaner system that is in use by your organization. Specific applications require certain filters for optimum efficacy. To ensure the proper filter gets ordered. 1) Power down Fumex Air Purifier. 2) Disconnect power. 3) Remove filter(s) and record a) the number of filters and b) the Filter Item #'s, found on each filter. For best results, all filters inside the system should be replaced at the same time. Feel free to call a Fumex team member at 800.432.7550, if you have any questions relating to which Fumex Replacement Filter best suits your application's needs. 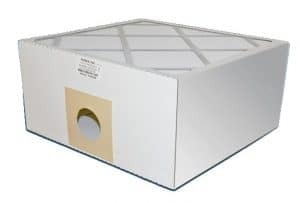 The 12” x 12” x 2” Fumex FA100-2 filter incorporates high performance HEPA media composed of borosilicate microfibers with an acrylic resin binder. This glass microfiber media is tested and certified at the manufacturer as meeting HEPA media standards with a DOP maximum smoke penetration of 99.97% efficient at 0.3 µm @ 10.5 ft/minute. The media is tested at the manufacturer to industry standards ASTM method F778-82 for permeability and the ASTM method D-2986 for DOP smoke penetration. The filter media element incorporates edge seal technology which is a continuous bead of hot melt that helps to prevent air bypass. A quick recovery, super-resilient polyurethane foam gasket is applied onto a thick moisture resistant beverage board frame. Each filter is labeled to identify the air flow pattern and a handle is attached fore ase in removal. The 12” x 12” x 2” Fumex FA101D Replacement Filter incorporates high performance blended bonded carbon technology. Bonded technology provides superior adsorption with minimal airflow resistance. The filter media element incorporates edge seal technology which is a continuous bead of hot melt that helps to prevent air bypass. A quick recovery, super-resilient polyurethane foam gasket is applied onto a thick moisture resistant beverage board frame. Each filter is labeled to identify the air flow pattern and a handle is attached for ease in removal. 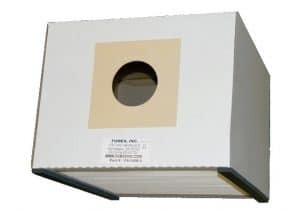 The Fumex FA102B filter incorporates a high performance spun bound polyester media and a high performance framed merv 11 media housed in white .024” beverage board frames. The filter media element incorporates edge seal technology which is a continuous bead of hot melt that helps to prevent air bypass. A quick recovery, super-resilient polyurethane foam gasket is applied onto a thick moisture resistant beverage board frame. Each filter is labeled to identify the air flow pattern and a handle is attached for ease in removal. 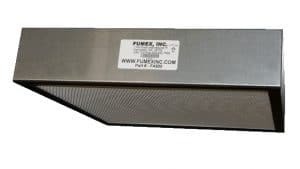 The 12” x 12” x 5.75” Fumex FA100 Replacement Filter incorporates high performance HEPA media composed of borosilicate microfibers with an acrylic resin binder. 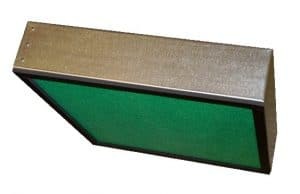 This glass microfiber media is tested and certified at the manufacturer as meeting HEPA media standards with a DOP maximum smoke penetration of 99.97% efficient at 0.3 µm @ 10.5 ft/minute. The media is tested at the manufacturer to industry standards ASTM method F778-82 for permeability and the ASTM method D-2986 for DOP smoke penetration. Bonded carbon technology. Provides broad spectrum gas control. The 12” x 12” x 6” Fumex FA201D Replacement Filter incorporates high performance blended bonded carbon technology. Bonded technology provides superior adsorption with minimal airflow resistance. 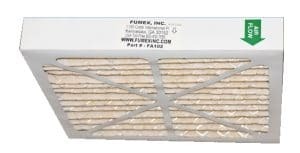 The Fumex FA140B-2 Replacement Filter incorporates high performance framed cellulose media. The filters will be housed in white .024” beverage board frames that consisting of 50 pleats. The pleats will have both inner and outer pleat lock. A quick recovery, super-resilient polyurethane foam gasket is applied onto a thick moisture resistant beverage board frame. Each filter is labeled to identify the air flow pattern and a handle is attached for ease in removal. 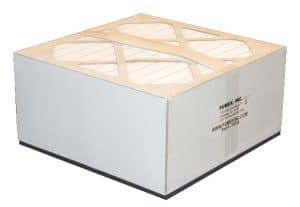 The 12” x 12” x 5.75” Fumex FA100 Replacement Filter incorporates high performance HEPA media composed of borosilicate microfibers with an acrylic resin binder. This glass microfiber media is tested and certified at the manufacturer as meeting HEPA media standards with a DOP maximum smoke penetration of 99.97% efficient at 0.3 µm @ 10.5 ft/minute. The media is tested to NSF standards ASTM method F778-82 for permeability and the ASTM method D-2986 for DOP smoke penetration. The FA540B filter incorporates high performance framed cellulose media. The filters are housed in white .024” beverage board frames that consists of 100 pleats. The pleats will have both inner and outer pleat lock. The filter media element incorporates edge seal technology which is a continuous bead of hot melt that helps prevent air bypass. A quick recovery, super-resilient polyurethane foam gasket is applied onto a thick moisture resistant beverage board frame. Each filter is labeled to identify the air flow pattern and a handle is attached for ease in removal. for permeability and the ASTM method D-2986 for DOP smoke penetration. The 18” x 18” x 4” Fumex FA501D Replacement Filter incorporates high performance blended bonded carbon technology. Bonded technology provides superior adsorption with minimal airflow resisitance. The filter media element incorporates edge seal technology which is a continuous bead of hot melt that helps to prevent air bypass. 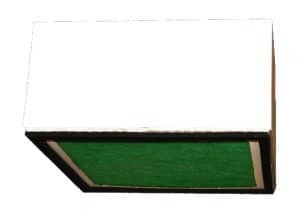 A quick recovery, super-resilient polyurethane foam gasket is applied and the media is framed in a galvanized steel frame. Each filter is labeled to identify the air flow pattern and a handle is attached for ease in removal. Fumex FX1 filter is specially designed for the treatment of gases and odors generated in many industrial processes. Filter is constructed of chemical resistant polypropylene shell (12” x 12” x 12”) and each filter contains aprox. 25 lbs of carbon media. The 18” x 18” x 4” Fumex FA501D Replacement Filter incorporates high performance blended bonded carbon technology. Bonded technology provides superior adsorption with minimal airflow resistance.